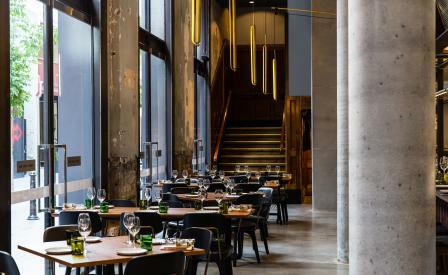 Michelin-starred British chef, Jason Atherton, launches his first Australian restaurant on a former brewery site in Sydney’s inner city Chippendale precinct. The lofty Kensington Street Social forms part of the recently opened Old Clare Hotel together with adjoining degustation restaurants, Automata and Silvereye. All were developed by Loh Lik Peng, director of Unlisted Collection, a global boutique hotel and restaurant group. Open daily for breakfast through to dinner, modern Mediterranean share plates showcase raw, cured and cooked local produce with a fusion of indigenous Australian and Japanese flavours. Expect kangaroo, Wagyu beef and Moreton Bay bugs plus accents of lemon myrtle, wattle seed, wasabi and miso. The creaminess of Atherton’s slow-cooked hen’s egg mixed with chewy roasted corn and the sharp tang of crisp seaweed, Parmesan, sage crumbs and roasted chicken scratchings best demonstrates his sublime textural pairings. Designed by Shanghai-based Neri&Hu and executed by architect Matt Darwon with GP2 Projects, the interior draws on the site’s industrial heritage. The stripped former brewery administration office walls reveal original tiling and brickwork, whilst two towering steel islands run the restaurant’s length. One frames an open kitchen and supports a mezzanine dining area directly above, the other, the bar. Clad in louvered panes of glass and mirror, they refract light entering through the soaring windows lining the laneway entrance, and reflect a multitude of hidden angles within. Neri&Hu’s custom-built timber tables and chairs with bottle green and charcoal leather seating create natural warmth amid the concrete finishes, whilst sinuous brass light rods suspended over the tabletops, also custom-designed by Neri&Hu, add a golden patina to the restaurant’s brass accents. Dark amber and sea green glassware made from recycled bottles by Tevita Havea discreetly nod to the area’s beer-swilling lore.